​Sydney Blue Gums are the epitome of the eucalypt family. Sydney Blue Gums are a tall, straight tree with a wide, branching canopy. They grow to 50 metres tall in a variety of conditions but do prefer fertile soils with moderate amounts of moisture. At Bangalee, youngish blue gums can be seen growing around the edge of the picnic ground while more mature trees are located alongside the river track. Blue gums get their name from their smooth, grey-blue bark. However, in older trees, the lower few metres can actually be covered in rough, brown bark with the smooth bark only starting near the first branch. Blue Gum leaves are long and thin and droop slightly from the branch. White flowers occur in late spring and summer emerging from the node where the leaf connects to the branch. At Bangalee, we plant Blue Gums on the river flats. The rapid pace of growth provides a long-term canopy as well as long-term soil stability. Not only that, but Blue Gums host a range of native species and form a major part of the ecosystem in areas in which they are present. ​​Spotted Gums are probably the grandest, naturally-occurring tree at Bangalee. They often exceed 50 metres in height and almost always have a perfectly straight trunk. They are very easily identified by the small, greenish patches all over their smooth, grey bark. In some trees such as the one on the left, the base spreads over its surroundings causing it to get a distinct bulge. Because of the number of large rocks in the ridges at Bangalee, this effect can be seen quite regularly. Sometimes it is still possible to see the rock under the Spotted Gum before it has completely grown over it. ​​Spotted Gums prefer the area slightly above the river flats. They can regularly be found growing at the base of the escarpment and in the drier regions above the river flats. Older Spotted Gums often have several large hollows where branches have fallen off. This makes them a very popular nesting tree for a number of birds including owls, cockatoos and several other species. ​The Angophora is a large gum tree that grows to around 30 metres high. Unlike other gums though, its branches twist and warp in all directions giving it a distinctly gnarly appearance. Despite the twists and turn in the branches, the main trunk of the Angophora is usually quite straight. It also gets very thick as the tree ages. The entire trunk and all the branches are covered in a rough, thick, grey bark. 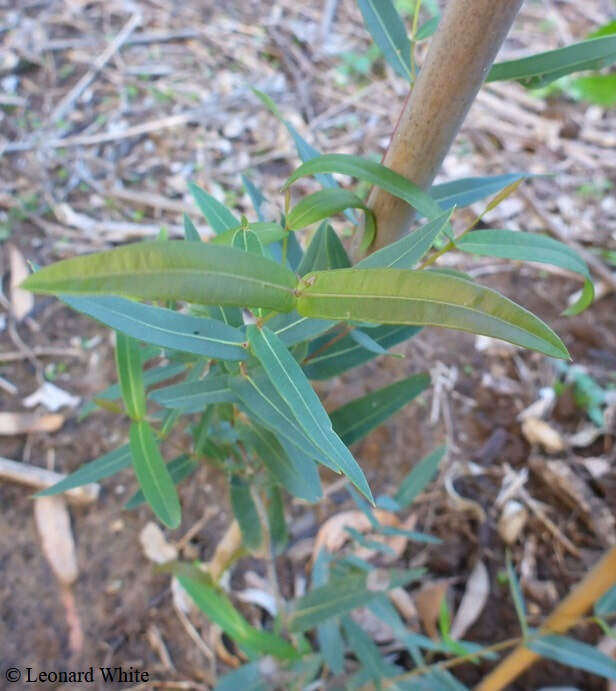 The leaves are a typical eucalypt shape albeit a little shorter. Large clusters of white gum flowers appear at the on the crown of the tree in late spring and summer. Angophoras thrive along the river flats at Bangalee. As with Sydney Blue Gums, they are fast growing and provide an excellent long-term canopy. Another advantage is that they are slightly more drought tolerant as seedlings than many other species of eucalypt or bloodwood. ​The Turpentine is a very large tree belonging broadly to the same family as eucalypts, bloodwoods, lilly pillys and tea trees. It gets its name from the scent of its leaves which smell remarkably like turps when crushed. It is a unique tree in that it is highly drought tolerant and can thrive in virtually any type of soil. ​At Bangalee, it can be found growing on the ridge tops right down to the edge of the Shoalhaven River. The Turpentine also has an extensive root system which often produces several suckers within a few metres of the main tree. Its excellent adaptability makes it an ideal tree for regeneration projects in almost any location. ​Turpentines flower in spring producing thousands of white flowers that more closely resemble lilly pilly flowers than eucalypt flowers. As the flowers age, they steadily turn pink. By mid-summer, the Turpentine drops its seed pods. Once again, these only sort of resemble gum tree seeds. Whereas a gum tree seed pods have a single opening to release the tiny seeds inside, Turpentine seed pods have six. Germination: Seed with ash, and possibly cutting.